On Sunday, I decided to tackle the bathroom cabinet “recoloring”. This is our test run to see if we can darken our kitchen cabinets ourselves (EASILY) or if it’s going to require a lot more elbow grease than we are willing to exert (or have the time for). 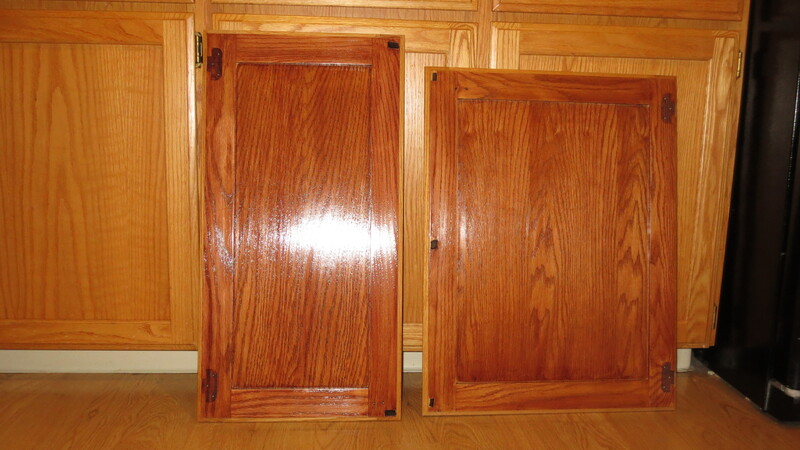 Step one (used for any cabinet door that I was test staining): spray the door with “Liftoff”, let set for 60 seconds, scrub with a Scotch-Brite pad, rinse with clean wet rag, wipe dry. Then lightly sand the surface with 150-grit sandpaper. Take One: The stain I bought for this project was Minwax Polyshades in Antique Walnut Satin. It’s a stain and polyurethane in one, and only needs one coat (according to the can). Well, there was hardly any difference in color, not enough to make it worthwhile, so I stopped at the halfway mark. Plus, I noticed it was ‘bubbling’ and looking weird, so I quickly wiped it all off. So the next question is….will that color change be enough to satisfy our needs in the kitchen? 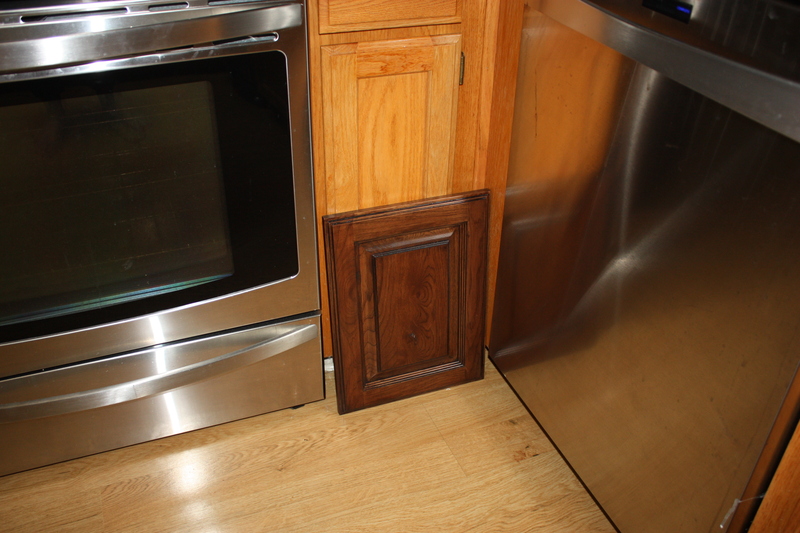 I put the door in the kitchen to see…. Take Three (new door): Searching for dark dark stains, I grabbed the Cabot Australian Timber Oil that I used on the arbor, and it’s definitely darker, but I’m not confident that it suits our needs. I’m concerned about long-term tackiness, too. (No picture, sorry). 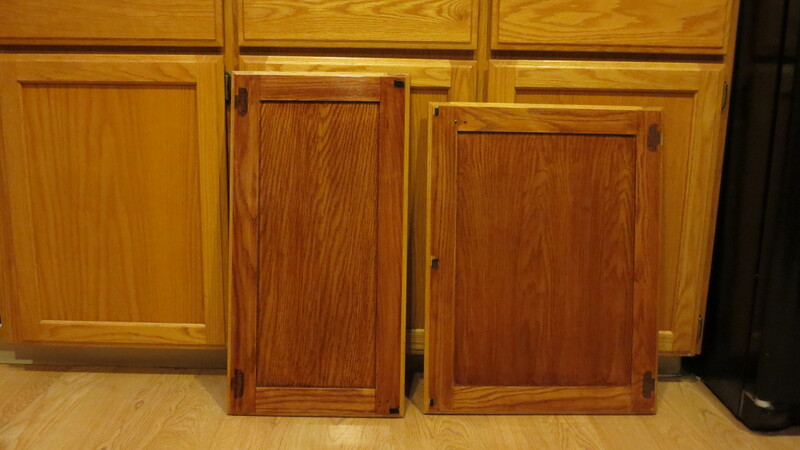 Take Four (new door again): I decided to go back to the regular Minwax Red Mahogany color that I tried in Take Two. This time I brushed it on and let it set for 15 minutes before wiping it. The color turned out much better. The darkest I’d seen yet. Um, no real difference between one coat or two. I supposed the two coat is a tad darker. Of course the color isn’t the only factor here….we need to make sure the new color actually sets and cures and doesn’t remain tacky! Cuz that would be a fail. Which would put us back to having someone ELSE doing all the work for us, because there’s no way I’ll be sanding and stripping all our cabinets BARE. Stay tuned to see what we decide! Previous Previous post: Karate: From Gold to Green! Update: the stain remained tacky so I had to wash it off with mineral spirits. This whole test was a fail.